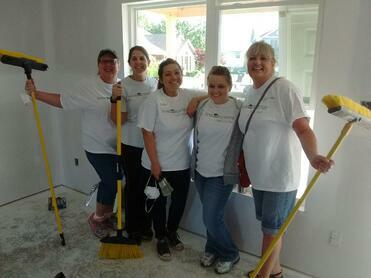 Bank Independent's Helping Hands program began in 2011. When tornadoes swept across North Alabama on April 29, many our team members immediately stepped up and looked for ways to help their neighbors; they used vacation and personal time to volunteer. The concept of Helping Hands came from these requests. Since 2011, each employee gets eight hours of paid volunteer time to give back to the communities we serve through organized volunteer efforts. We've had many opportunities to do this in 2017, and for this, we are very thankful. 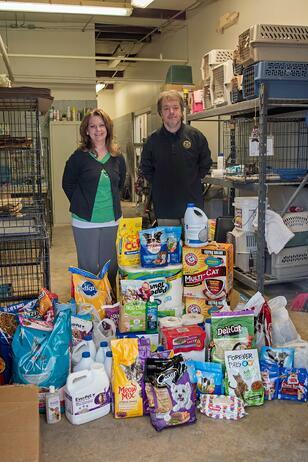 Our February drive to collect pet food and supplies for area shelters has been one of our employees' favorites. So many of us hold a special place in our hearts for our pets and for our furry friends that don't yet have homes. Knowing that our community's donations are going to help those animals get the care they need from our local shelters is truly a blessing. This year the Shelter Share program resulted in the donation of 1003 items plus $952.81 in cash for our shelters. The drive was also directly responsible for three pet adoptions! The shelters also offer our most popular volunteer opportunities. 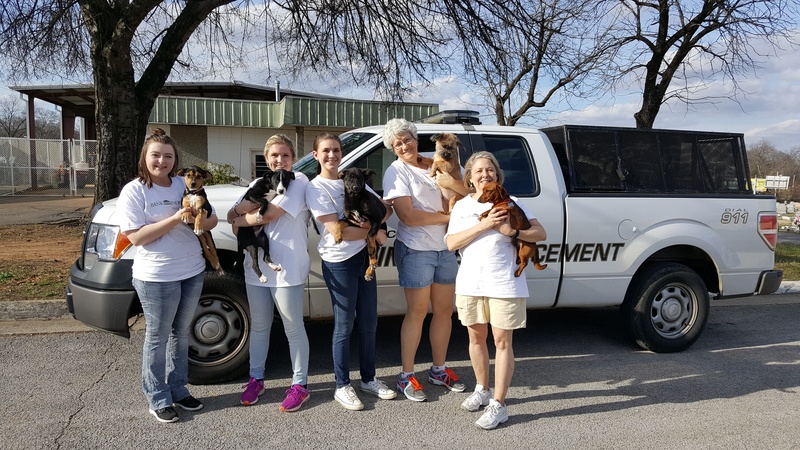 Our team members spent hundreds of hours at the shelters in 2017, walking and bathing dogs, cleaning pens, painting walls...or simply spending time with the sweet shelter animals. thrilled to be able to fill their shelves with the donations from our customers and friends, and we're thankful to be able to facilitate their giving. Department of Human Resources in Limestone County. We end each of our drives with a full-filled day of giving, where our Helping Hands volunteers set up convenient all-day opportunities for our friends and neighbors to donate at local stores. 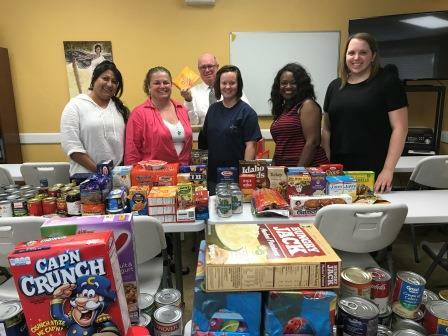 After our 2017 events, our partner organizations picked up and distributed 7898 donations of canned or boxed foods and shared cash donations of $1257.00. Every year parents are faced with the challenge of purchasing a long list of school supplies for each of their children. For some, it's impossible task. 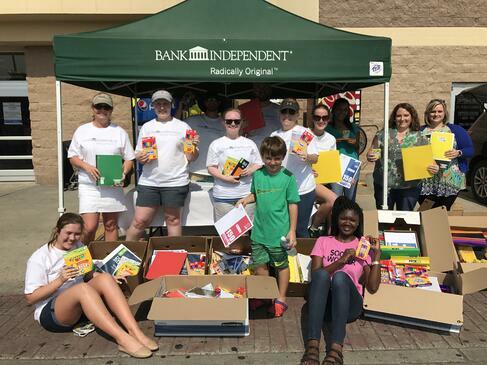 We enjoy being able to spearhead a drive that provides local families with the school supplies they need to start the school year. We're thankful that we have the opportunity to make the beginning of school a little better for families in our footprint. We partner with local organizations to distribute school supplies directly to local children in need. This year's drive netted nearly 10,000 items--9417 to be exact--plus cash donations of $464.90. Donations were distributed locally just in time for back-to-school! Our last annual collection effort, Toy Share, begins the day after Thanksgiving. Every Bank Independent office is accepting donations of new, unwrapped toys which our partner organizations will share with local families just in time for Christmas morning surprises. This is our seventh year of sharing, and our customers, neighbors and friends exceed our expectations every year. We're thankful for your generosity! William Porter Foundation in the Shoals. The needs in our communities are great, and these wonderful organizations have programs in place to ensure that no child in the Tennessee Valley wakes up with no toys under the tree on Christmas Day. 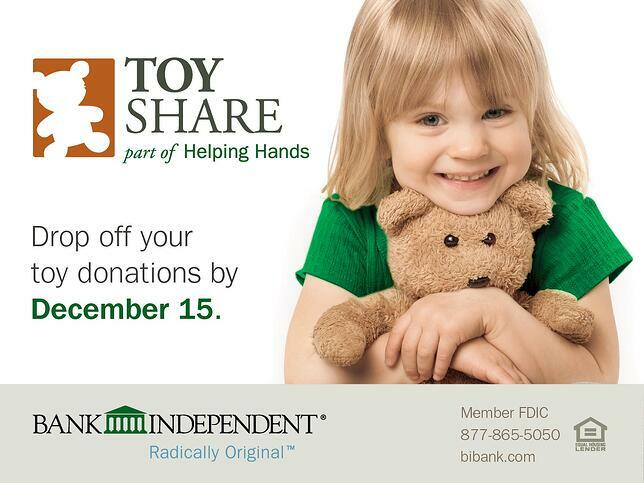 Won't you help us by dropping off a new, unwrapped toy at any Bank Independent location? Your donations will stay in YOUR community and benefit YOUR neighbors. Thank you in advance for your generosity! But most of all, this year we're thankful for our amazing team members and our valued customers, without whom Bank Independent wouldn't be the same. From our family to yours, we wish you the happiest of Thanksgiving holidays!